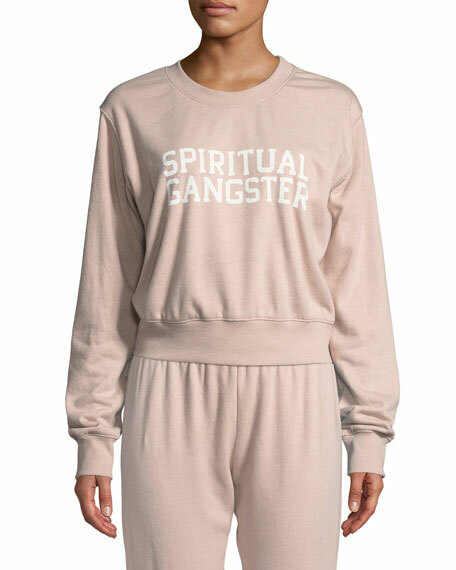 Spiritual Gangster sweatshirt with varsity logo graphic. Champion Europe sweatshirt with embroidered logo details. Drawstring hood. Long sleeves. Kangaroo pocket. Relaxed fit. Pullover style. Cotton. Imported. Model's measurements: Height 5'10"/177cm, bust 33"/84cm, waist 25.6"/65.2cm, hips 35.8"/91cm, dress size US 2-4/FR 34-36. Etoile Isabel Marant "Milly" sweatshirt with front logo detail. Ribbed neck, cuffs, and hem. Crew neckline. Long raglan sleeves. Relaxed fit. Pullover style. Cotton/polyester. Dry clean. Made in Portugal.